Before you fulfill your dream of driving a jet ski on the waters of the Florida Keys, make sure you're not breaking any laws. The Florida Statutes dictate the legal age of operation and rental of jet skis as well as required safety equipment. Jet ski rental companies should ensure that their policies comply with all relevant rules and regulations. 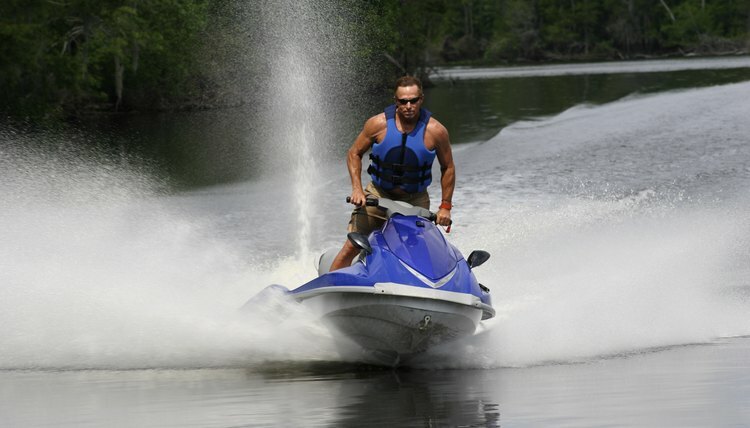 Under Florida law, a jet ski is a personal watercraft, or PWC. This is a vessel less than 16 feet long with an inboard motor powering a water jet pump as its primary source of motive power and designed to be operated by a person sitting, standing or kneeling on the vessel, as opposed to the conventional manner of sitting or standing inside the vessel. A vessel may be any type of boat, including a watercraft, barge and airboat, but excluding a seaplane, which may be used as a means of transportation on water. You must be at least 18 years of age to rent a jet ski or other type of PWC in Florida. However, the legal age to operate a jet ski in Florida is 14. It is against the law for a person to knowingly allow another person under 14 years of age to operate a PWC. Under Florida PWC laws, every person operating, riding on or being towed behind a PWC must wear an approved noninflatable wearable personal flotation device, or PFD. You are not allowed to wear inflatable PFDs on jet skis. The person driving the jet ski must attach the engine cutoff switch lanyard, if provided, to her person, clothing or PFD. Navigation lights are required from sunset to sunrise under both federal and state laws, and jet skis may not be driven from 30 minutes after sunset to 30 minutes before sunrise under any circumstances. Reckless operation of a vessel is a first-degree misdemeanor in Florida. This includes maneuvering a PWC by weaving through congested vessel traffic, jumping the wake of another vessel at an unreasonably close distance or when visibility around the vessel is obstructed, or swerving at the last possible moment to prevent a crash. Anyone born on or after January 1, 1988 needs a boating safety education ID card to operate a vessel with 10 horsepower or greater on Florida waters. If you are a resident of Florida, you can take an online boating safety course approved by the Florida Fish and Wildlife Conservation Commission to get a boating safety education ID card, which lasts for your lifetime. Exams are also available through contractors to get a temporary certificate, which is valid for 12 months from the issue date. Gillespie, Claire. "Florida Jet Ski Driving Laws." , https://legalbeagle.com/6025374-florida-jet-ski-driving-laws.html. 24 July 2018.